Instagram has been the best option for brands looking to get exposure and engagement. The simple storytelling style of Instagram makes it unique and more rewarding than any other visual content sharing platform. If you’re looking to up your brand marketing game and getting in front of a new audience, then Instagram’s 500 million users are what you should be focusing on. Instagram makes it further easy by allowing various content formats like photos, videos, GIFs, and illustrations which can act as your brand voice and tell your story to your audience. Now, if you’re confused about what to post on Instagram, here are top 10 creative things to post on Instagram to grow your followers, drive engagement and help you generate leads and sales. 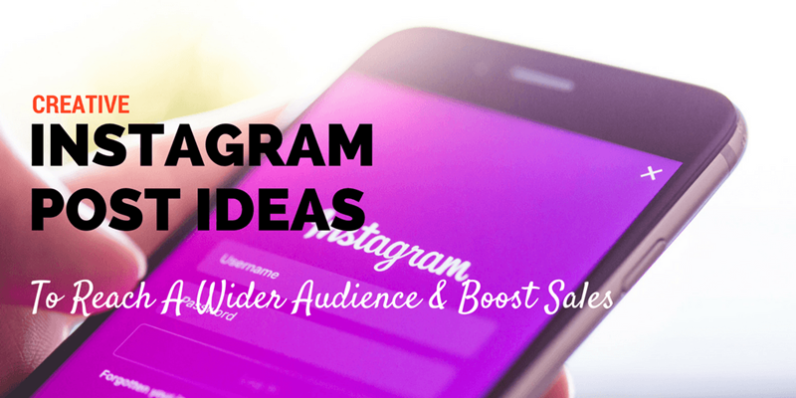 Ready to explore and leverage creative Instagram post ideas to reach a wider audience base? When you are a brand that wants to engage your audience on Instagram, creative storytelling is the best thing you can do. Visual storytelling goes a long way to immerse your audience into the product experience you want them to have. Images can go a long way in convincing your audience to relate to what you speak. A personal photo, an inspiring quote that touches the pain point (and heals it) of your audience will make it to the bottom of their heart. Since Instagram allows videos too, you can take visual storytelling to a whole new level. Get creative and make something that allows your audience to identify themselves with the post. For example, Rachel Ryle has a vibrant brand where she designs animations and stickers for smartphones. She knows that simply showing the images of her creation won’t work. She needs to give an immersive experience that just touches the audience and hits the right chords. Rachel posts various stop animations with seasonal topics (mainly around the themes of her stickers) that are just beautiful and addictive. Check out this post of hers where she has a stunning Halloween stop animation that showcases her Halloween stickers for IOS with a great story. Needless to say it crossed nearly 559K views. Some of her animations have more than 1 million views, so yes you can stay assured that storytelling works. If you have a product or a service, don’t throw the rates or pricing or even the features at their face, instead use what copywriting experts do; show them how your product can benefit them. If you have a health drink, show your audience how they can use it to remain healthy. Even if you are in a boring business like being a B2B writer, instead of saying you know how to write white papers or brochures, you could post a mini video about how a client got 150% more sales because of your copy. One brand that does it right and loud is Playdoh. Almost everyone I know is a fan of Playdoh, and they don’t just sit on this fact, they use it to show what more you can do with it. They have an account jam-packed with creative things you can do with Playdoh and thus subtly hinting you to get one for your kid (or you!). One thing that works like a charm is word of mouth. In the digital world, shoutouts and testimonials have similar value. Be with the ones that your audience trusts or hangs out with i.e., influencers in your niche. When you get an influencer to speak about your brand, to admire the work you do or simply share an article they were mentioned in, you will get access to the huge base of loyal followers of them. Influencers are what they are because their fans/followers have immense respect and love for them. Fans look up to every update from these influencers and are ever-ready to get their hands on any recommendations made by them. You can use this to tap into their fan base, interact with their audience and make them your followers. Influencer marketing is a full-fledged strategy used by brands on social media platforms, and you can use the same to grow your Instagram followers and sales too. Asking direct shoutouts don’t work that well, but you can build a relationship with them that will help you in the long run. Here is what SEMrush does. They sent a cute Christmas gift to Adam Connell which he posted on Instagram. Christmas came early. Big thanks to Olga and the SEMrush team! You should note that SEMrush did not ask Adam to post their gift in return (they, like other companies did it as a gesture of friendship) but Adam of course shared it as a way to share his happiness and love back for the team. This was a mutual friendly act but it also exposed SEMrush to the audience that follows Adam. SEMrush has done it time and again and made me a fan of them. I firmly believe that your network is your net worth. And if you can get your audience’s star celebrities to introduce you to them, it will be the best win ever. Instagram recently launched Multiple-Image Update feature. If you’ve used Facebook “slideshow” update feature or carousel ads you know how multiple images can help you tell more with just one update. If you’ve much to say or don’t want to bombard your followers with repeated updates throughout the day, Instagram Multiple-Image feature has got your back. With Multiple-Image feature, you can add up to 10 images or videos to your single update and while still applying individual editing/filter option to each of the components. You can use this feature to tell effectively showcase a full album of your art series or even a full-fledged product carousel. You could also use the feature to get more space to show tutorial style videos or showcase the top 10 quotes/lessons from a bestseller book that you just read. Or even spice it up with the 10 subheads of your blog posts to invoke curiosity and then redirect that to your blog posts. Customer testimonials can also go a great way but I feel using 10 images/videos or praise words in a single update might seem a bit ranty. What say? Here is a detailed guide to leveraging Instagram Multiple-Image posts to get more done. Instagram has always been a plentiful resource to reach a wider and much engaged audience. Using the right marketing techniques and being creative can help you reach a them in no time. Don’t forget to check Instagram analytics for your updates to see which Instagram post idea is getting more response and what isn’t working; experimentation is the key I would say. What creative Instagram post ideas have worked for you? Do you have a strategy that you want to share with others? Do share them in the comments below.